Hey Everyone! Today I want to share some more women’s fragrances either to give you an idea or a gift for someone or a gift for yourself. These are a few definitely worth checking out. EVAmour from Eva Longoria. Normally, I am not a fan of Celebrity fragrances. In the past I have not been able to find any that I find unique. 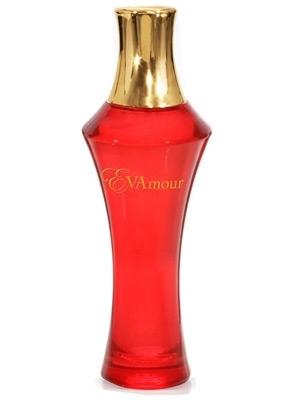 But, I have now tried Eva and Evamour, both in the Eva Longoria fragrance line and both I just LOVE. Evamour is the newest scent. It comes in a beautiful red and gold bottle. This scent is deeper, and more sultry then the first fragrance, Eva , which is lighter. It opens with juicy notes of bergamot blossom, pink lady apple and red currant. Tiger lily, rose, frangipani and pink peony form the floral heart of the fragrance, followed by the warm base of woody and musky tones, amber and vanilla orchid. Hope you all enjoyed these fragrance recommendations! Check out my facebook page for all my updates , photos and more! Talk to you tomorrow for more last minute gift ideas! !